Cloud computing is the most significant technology development of our lifetimes. It has made countless new businesses possible and presents a massive opportunity for large enterprises to innovate like startups and retire decades of technical debt. But making the most of the cloud requires much more from enterprises than just a technology change. Stephen Orban led Dow Jonesâs journey toward digital agility as their CIO and now leads AWSâs Enterprise Strategy function, where he helps leaders from the largest companies in the world transform their businesses. As he demonstrates in this book, enterprises must re-train their people, evolve their processes, and transform their cultures as they move to the cloud. By bringing together his experiences and those of a number of business leaders, Orban shines a light on what works, what doesnât, and how enterprises can transform themselves using the cloud. Implement successful and cost-effective enterprise architecture projects. This book provides a new approach to developing enterprise architecture based on the idea of emergent behaviorsâwhere instead of micromanaging system implementation, the enterprise architecture effort establishes clear goals and leaves the details to the implementation teams. System development efforts are measured based on their contribution to achieving business goals instead of implementing specific (possibly outdated) requirements. Most enterprise architecture initiatives employ one of the existing system architecture frameworks such as Zachman or The Open Group Architecture Framework, but these are not well-suited for enterprise architecture in a modern, agile organization. The new approach presented in this book is based on the authorâs experience with large enterprise architecture efforts. The approach leverages research into complex adaptive systems and emergent behaviors, where a few simple rules result in complex and efficient enterprise behaviors. Simplifying the task of establishing and maintaining the enterprise architecture cuts the costs of building and maintaining the architecture and frees up those resources for more productive pursuits. System implementers are given the freedom to rapidly adapt to changing user needs without the blessing of the enterprise modeling priesthood, and the architecture is transformed from a static pile of obscure models and documents into an operational framework that can be actively used to manage an enterpriseâs resources to better achieve business goals. The enterprise architect is free to stop focusing on building and maintaining models and start focusing on achieving business goals. The book is divided into three main parts, the first of which (Chapters 1â2) addresses the background and motivation for AIDAF aligned with digital IT strategies. The second part (Chapter 3) provides an overview of strategic enterprise architecture (EA) frameworks for digital IT, elaborates on the essential elements of EA frameworks in the digital IT era, and advocates using AIDAF, models for architecture assessment/risk management, knowledge management on digital platforms. In turn, the third part (Chapters 4â7) demonstrates the application and benefits of AIDAF and related models, as shown in three case studies. Many organizations are facing the uphill battle of modernizing their legacy IT infrastructure. Most have evolved over the years by taking lessons from traditional or legacy manufacturing to create a production process that puts the emphasis on the process instead of the people performing the tasks. This allows the organization to treat people like resources to try to achieve high-quality outcomes. But those practices and ideas are failing modern IT, where collaboration and creativeness are required to achieve high-performing, high-quality success. Mirco Hering, a thought leader in managing IT within legacy organizations, lays out a road map to success for IT managers and tells them how to create the right ecosystem, how to empower people to bring their best to work every day, and how to put the right technology in the driver's seat to propel their organization to success. But just having the right methods and tools will not magically transform an organization. The cultural change is the hardest and the most impactful. 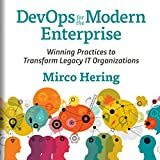 Using principles from Agile, Lean, and DevOps as well as firsthand examples from the enterprise world, Hering addresses the different challenges that legacy organizations face as they transform into modern IT departments. Master a proven approach to create, implement, and sustain a data strategy. Pervasive, data is a unique organizational resource, and this distinction warrants its own strategy. Data, representing your single non-depletable, non-degradable, durable strategic asset, is likely also your most poorly leveraged and underutilized organizational asset. Why do half of all technology projects fail? A major reason is that organizations often pick the wrong tools, leaving them digitally hamstrung from the start. This book offers a modern alternative to traditional waterfall approaches to selecting technology. Youâll learn a practical, adaptive process that relies on realistic storytelling and hands-on testing to get the best fit for your enterprise. Book DescriptionThis eagerly awaited second edition of Learning ServiceNow has been fully revised to cover the new and updated features of the ServiceNow platform. It will show you how to put important ServiceNow features to work in the real world, while introducing key concepts via examples of managing and automating IT services. This book will help you build a solid foundation of key concepts and demonstrate how to effectively implement and configure modules within ServiceNow. You'll learn how to configure and administer your instance and then move on to building strong user interfaces and creating powerful workflows. You'll also cover other key elements of ServiceNow, such as notifications, security, reporting, and custom development. The book will serve as a guide to helping you understand how to improve and automate your business' workflow and processes. By the end of this book, you will be able to successfully configur and manag ServiceNow. Who This Book Is ForIf you're an IT professional or administrator looking to, or are already trying to, implement ServiceNow in your organization for Enterprise IT service management tasks, this book is for you. Enterprise Governance by Michael M. Gorman Paperback Book Free Shipping!